Make 2 observations about the picture. What does it show about slavery? What does this show about slavery? It show that slaves were treated very badly.They were beaten every minute even if they do anything wrong. My two comments about the picture is that black people is hurting white people.Black people should no do that because they dont have the rights to do all that.They are hitting the white people they are treated them bad like if they werent a human. TWO OBSERVATIONS I SEE IN THE PICTURE ARE THAT THE SLAVES ARE BEATING UP THE WHITE PEOPLE.ALSO I SEE THAT THE OPPOSITE OF SLAVERY IS GOING ON THE PICTURE.THIS TELLS ME THAT THE SLAVES ACTUALLY ATTACKED BACK TO THE WHITE PEOPLE. Balck people fighting….there are dead people on the grown…..
Well i see people hiting other people and it looks like they are also whiping them. It looks like slavery. I see people want knift and poeple died and people landing down and a person had a stink hit people want it. observations that i took by looking at this picture is that a white man is hitting a slave if that’s what we can call it i think he didn’t fallow directions. I see the people firing whit the other peson. I see the people craying. I see people getting beaten up. I see dead people on the ground. I think they are beaten up the white people with sticks. ii think that the slaves had take control.they are the ones beating up the white people. In this picture it show’s that slaves are fighting the white men. the slaves are beating up the white men and it look’s like the slaves are going to kill them. black people are hiting white people . also whites want to defend them self but they can’t do it . the slaves were taking over the americans by beating them up just like they did slaves. This picture is telling me about slavery that the slaves were being beatin to death. It is also telling me that the slaves were being treated like the had killed somebody or if they stold something to the point where they are killed for not doing their jobs right. I see people beating other people with bats.I also see someone screaming for help. Here I see the slaves beating the white men. The man has a wooden stick and is beating a white man with it. It shows me that the slaves were in control once. On the picture i see the slaves beating down the white men.The picture shows me that the slaves were in control. I THINK OHH! WHAT THE WHITE MAN IS GETING HIS WOPEIN. 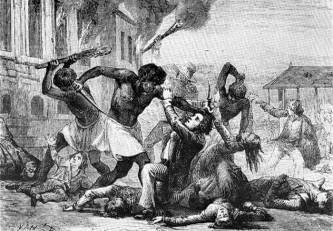 In the picture it seem like if the slaves are now taking revenge against the white people.You could see that a slave is beating the white man in the ground.This shows that the slaves have alot of anger in the white men and want to hurt them as the way that the white men hurted them. what i see in this picture is that apparently the slaves are fighting off the white slave owner and they are beating them with weapons and even their own hands!! I see slaves fighting back to the white people.I’m glad that happened to them I’ve always hated white people! I THINK IT IS ABOUT SLAVES WHO GOT THERE REVENGE.THEY GO BACK AND KILL SOME OF THIER SLAVE MASTERS. one thing is that an african american is about to stab a white man and another is going to hit the same man with a large stick on his leg. the black people is beting the white people. i see the slaverys fighting with the white people .it look like if then killing the slaverys. I SEE BLACK PEOPLE BEATING THE WHITE PEOPLE.. It looks like the slaves were beating up the whites because they were mad and wanted payback for somethin. my two observations on this pictures is african americans beating up white people.i think that they used revenge in a way of mind for the cause that the whit people have done to them and there familys.i think that the black peple did the right thing to the wites because of the harm but in my other side i think that the black people shouldnt have done it because its not a good way to come back and hurt people…this picture discribes how whites felt of bieng mistreated but also shows how angry the black people were and how they felt. I see that the white people are geting beat up by the slaves. Also i see that the oppsite of the slavery is going on the picture.This tells me that the slaves did actually attacked back to the white people. MY TWO OBSERVATION IS THAT THE SLAVE FINALLY STOP BEING AFRIAD OF THE WHITE MENS AND STOOD UP FOR THEIR FREEDOM THEY’RE BETTING UP THE WHITE MENS. THE OTHER ONE IS THAT THEY ARE GETING PAY BACK OF THE WIPING AND SUFFERIGN THEY USE TO GET FROM THEM NOW IS THERE TURN TO FEEL THE PAIN. WAT I SEE IS PEOPLE,KIDS WERE BURNT OUT OF DOING THAT HARD WORK IN THE HOT SUN.AND I SEE THEY’RE GETTING BEATEN BY THE OWNER AND SOMEONE ELSE.THE MOM TRYING TO PROTECT HER DAUGHTER AND SON. i think the black people are hitting the white people and that their is a men and a women on the floor dead. I see Africans beating the white men and women. A white man is trying to shoot someone with his gun. THAT THE AFRICANS AMERICANS ARE BEATING UP THE WHITE PEOPLE……………………………………………. People getting beat on by Afdrican people. People getting stoled by their land. the picture is old and the african americans are beat up the white people. To me it shows that the white people was gettin beaten by the black race people. ON THE PiCTURE i SEE THE SLAVES BEATiNG DOWN THE WHiTE MEN.THE PiCTURE SHOWS ME THAT THE SLAVES WERE iNCONTROL. I see the african beating up the white men nd women nd the white men is trying to shoot them…. I value most and life is my family because without them i dont know were i would be and life.the most important thing to me is the Lord because he died on the Christ for me. I value my family and education and Jesus the most.the most important thin to me is to get my education so I could be sucessful. I VALUE MYSELF BECAUSE IF I DON’T THEN NO ONE ELSE WILL SO I VALUE MY SELF ALOT,I’M A YOUNG GURL I’M EXPENSIVE AND LIKE NICE THINGS!!!!!!!!!!!!!!!!!!!!!!!!!! The ghetto exists because there are some black people who are different. I don’t know why it was created.